Background: β-cyclodextrin, is a cyclic oligosaccharides bearing seven units of 1, 4-linked glucose units, having distinctive chemical structure i.e. its inner cavity is hydrophobic which facilitates the formation of host-guest complexes with the hydrophobic molecules. Methods: In the present study, we investigated the binding affinities and interactions of different oral anti-diabetic drugs within the cavity of β-cyclodextrin using in silico tool viz. molecular docking simulations for the selection of anti-diabetic drug to develop viable novel drug delivery systems. Results: An understanding of the structural properties of anti-diabetic drugs in relation to predicted docking scores with β-cyclodextrin reveals the suitability of the combination for drug delivery purpose. 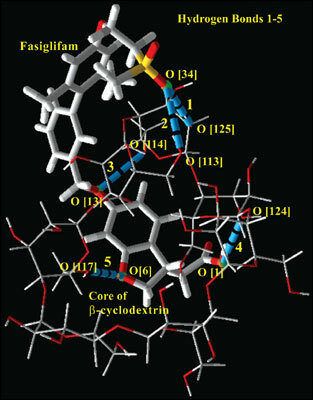 Among selected anti-diabetic agents, Fasiglifam bearing benzofuran scaffold with –COOH and –SO2 group exhibited maximum MolDock as well as Re-ranks score. Nateglinide demonstrated lowest MolDock score, while Alogliptin and Saxagliptin showed no H-bond interaction with the β- cyclodextrin. Conclusion: The binding conformations of anti-diabetic agents obtained from the present study can be mapped and will be helpful in the selection of polymer for formulation purpose. Furthermore, the results of the present study provide a guideline to select the polymers for the formulation of different therapeutic agents to attain better pharmacological profile with marginal toxicity. Keywords: β-cyclodextrin, diabetes, docking scores, molecular docking, novel drug delivery systems, oral hypoglycaemics. Affiliation:School of Pharmaceutical Sciences, Guru Ghasidas Central University, Bilaspur-495 009, C.G., School of Pharmaceutical Sciences, Guru Ghasidas Central University, Bilaspur- 495 009, C.G. Keywords:β-cyclodextrin, diabetes, docking scores, molecular docking, novel drug delivery systems, oral hypoglycaemics. Abstract:Background: β-cyclodextrin, is a cyclic oligosaccharides bearing seven units of 1, 4-linked glucose units, having distinctive chemical structure i.e. its inner cavity is hydrophobic which facilitates the formation of host-guest complexes with the hydrophobic molecules.